Smoking is the number one cause of lung cancer in the United States, according to the Centers for Disease Control and Prevention (CDC). More people die from lung cancer than any other cancers in the U. S. The more you smoke, the greater your risk. The CDC reference notes tobacco smoke exposes your lungs to over 7,000 toxic chemicals such as formaldehyde and tar. Seventy of these substances are cancer-causing. In addition to lung cancer, smoking also causes many other cancers including in the mouth, throat, and bowel. Eighty percent to 90 percent of lung cancers are linked to cigarette smoking. 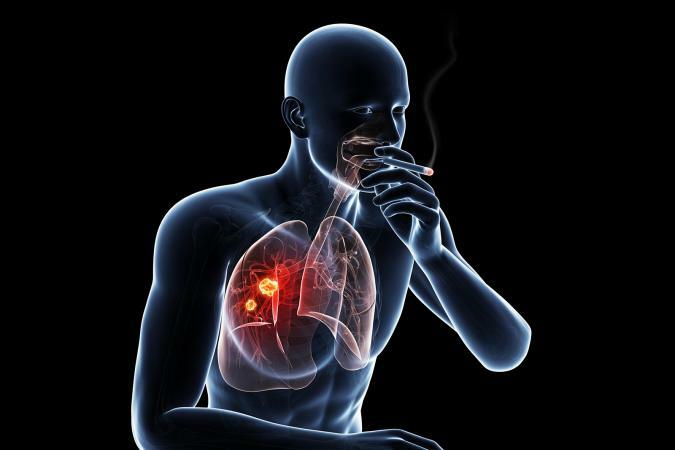 Cigarette smoking increases the risk for lung cancer 15 to 30 times more than those who don't smoke. Ninety percent of the deaths from lung cancer in men and eighty percent in women are due to cigarette smoking. Male smokers are 23 times more likely to die from smoking while women are 13 times more likely than those who never smoked. The more cigarettes a person smokes a day and the more years he smokes, the greater the risk of lung cancer. However, even occasional smoking exposes you to an increased risk of lung cancer. Adults and children who are exposed to secondhand smoke are also at risk for lung cancer. Over 7,000 adults per year die because of secondhand smoke. Cigars, pipes, and other types of smoking cause fewer lung cancers than smoking cigarettes. The following are other types of smoking that can also increase the risk for lung cancer. 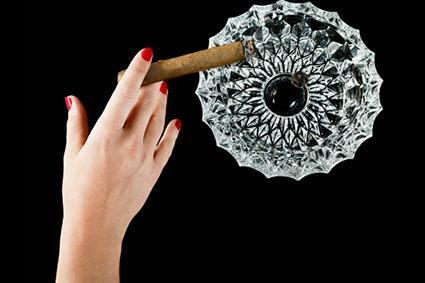 According to the National Cancer Institute, although cigars contain more toxins than cigarettes, people who only smoke cigars are at less risk for lung cancer. This is because most people who smoke cigars tend not to inhale the smoke into their lungs. Those who inhale are at greater risk for lung cancer. A study in the Journal of the National Cancer Institute in 2004 found smoking a pipe also causes lung cancer. However, the risk is lower than for cigarette smoking. This is also because pipe smokers tend to inhale little or no smoke. The risk is about the same or greater than for cigar smoking. A 2013 study found long-term heavy marijuana smoking doubles the risk for lung cancer compared to non-pot smokers. Weed smoke exposes the lungs to many of the same toxins and cancer-causing chemicals that tobacco smoke produces, according to the American Lung Association. Pot smokers also tend inhale the smoke deeper and hold their breath longer thus prolonging exposure of the lungs to the harmful agents. The vapor from electronic cigarettes, or e-cigarettes, or vapes, comes from liquid nicotine and flavorings that are heated by the device rather than from burning tobacco. Nevertheless, this vapor also has cancer-causing chemicals, including formaldehyde, that can attack lung tissue. The levels of these toxic agents are said to be lower than in regular cigarettes, according to Johns Hopkins. More studies are needed to estimate the degree of risk of lung cancer from vaping. According to the World Health Organization, smoking water pipes or hookahs are also dangerous to health. These devices carry a significant risk for causing lung cancer. People who give up smoking decrease their risk of lung cancer even after years of smoking. The risk will still be higher than someone who never smoked but quitting can make a significant impact on your chance of getting lung cancer. The younger you are when you quit, the more you decrease your risk of dying from lung cancer, according to another National Cancer Institute fact sheet. In addition, people who quit smoking after a diagnosis of lung cancer do better with treatment and have a lower recurrence and better survival rates than those who continue to smoke. Smoking can be hard to quit because the nicotine in tobacco is highly addictive. However, people should make a major effort to stop because of the high risk of lung and other cancers and various diseases. If you smoke, talk to your doctor about strategies to help you give up the unhealthy habit.